Students designed skate decks that appealed to a target audience, allowed for replication in various sizes and had space for logos. 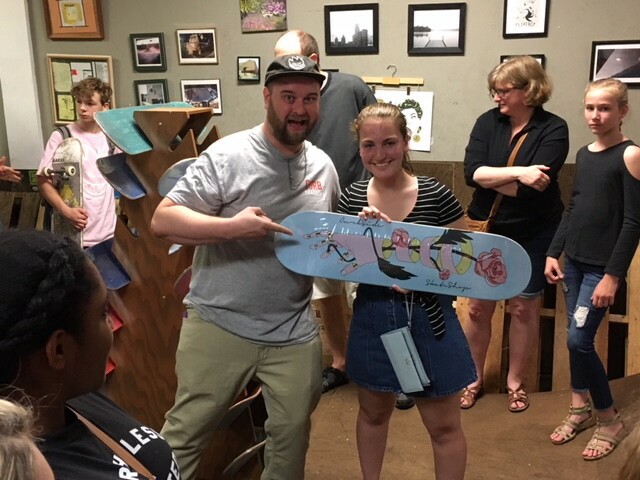 Shawnee High School art student Liz Speiser, right, shows off her winning skate deck design at Medford’s Curbside Skate Shop. Art students at Cherokee and Shawnee high schools recently took on a design challenge that officials with the Lenape Regional High School District (LRHSD) say provided students with a unique, real-world learning experience and the chance to have their art produced and sold on Main Street in Medford. The challenge — to design a skate deck that would appeal to a target audience, allow for replication in various deck sizes and have space for the addition of logos — was presented to the art students through a partnership between the LRHSD and the Curbside Skate Shop in Medford. Curbside announced Shawnee student Liz Speiser’s “Life’s Rose” as the winning design earlier this month during the Medford Art Walk. Curbside has manufactured Speiser’s design on 50 skate decks, with each one numbered and signed by Speiser to emphasize the limited quantity produced. They are currently for sale in the shop, and Speiser received a courtesy skateboard from the shop bearing her design. Speiser was among more than 60 students to feature their skate deck designs at Curbside during the Art Walk. Curbside’s manager Pat Brennan and owner Shawn Fleming ultimately chose Speiser’s design — a rose intertwined in a robotic-looking hand — to reproduce for sale in the shop. Brennan and Fleming worked closely with Cherokee art teachers Chris Coyle, Deana Guittar and Kahle Wagner and Shawnee art teachers Melanie Gessman and Mike Osmond to simulate a professional design assignment for students. Students first learned about their clients, including Curbside’s customers. They then investigated the origins of skate art, the skateboard industry and contemporary artists who currently work in the field. Next, they began their composition explorations with preliminary thumbnails, rough sketches and final sketches. After Curbside approved their final designs, the students began working on their final executions for display at the Art Walk.